Group Mobile, well known for carrying the top brands in rugged laptops, rugged tablet PCs, rugged smartphones, and rugged handheld computers has extended its product offerings to include the new semi-rugged Toughpad FZ-Q1 from Panasonic, an industry leader in reliable and innovative rugged mobile computers. The 12.5 inch, business-industry-focused tablet is designed to be much more durable than standard consumer-grade hardware, and is aimed at industries such as home health, code enforcement, transportation, point-of-sale (POS) retail, and small business applications. Panasonic President Yasu Enokido said the tablet will “allow increased gathering, sharing and accessing information, both in government and private sector applications.” “It provides the reliability, usability, and security that businesses require, as well as service infrastructures,” he said. The Toughpad FZ-Q1 provides the ideal level of durability for light duty field work. To meet the diverse market needs, the FZ-Q1 semi-rugged tablet comes in two performance configurations, a performance version featuring an Intel® Core™ i5-4302Y vPro™ processor and a standard model with an Intel® Celeron® processor N2807. The FZ-Q1 performance model comes with 8GB of memory, and 128GB SSD, upgradeable to 256GB solid state drive for optimum speed and performance, while the standard FZ-Q1 model comes with 4GB memory and 64EMMC,or 128GB solid state drive. When it comes to connectivity, the Toughpad FZ-Q1 offers an expansive selection of options including Wi-Fi, Bluetooth, and optional 4G LTE multi carrier with satellite GPS. The device also features USB 3.0, MicroSDXC, 2MP webcam, and an 8MP rear facing camera. Unlike consumer designed tablets, the Toughpad FZ-Q1 has integrated options for insertable or contactless SmartCard readers, a must for many government and healthcare users. Panasonic designed the new FZ-Q1 Toughpad to serve the government and utility sectors by equipping the new FZ-Q1 with a Full High Definition, 350nit, 10-finger touchscreen with built in anti-reflective (AR) screen treatment. Other usability features include an easy grip bottom cover, integrated stylus, and fast charging battery that outperforms consumer grade tablets. A full range of accessories are available with the Toughpad FZ-Q1, notably a spill resistant, backlit keyboard with carrying strap, desktop cradle, rotating hand strap, and more. 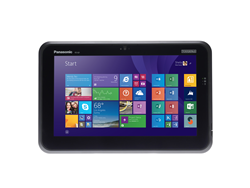 The Panasonic semi-rugged FZ-Q1 tablet can be ordered from Group Mobile today. To learn more, visit: http://www.groupmobile.com/buy.asp/sku=8016/dept_id=/mf_id=1/Panasonic+Toughpad+FZ-Q1+Tablet.html, or call toll free 866-RUGGED8 (1-866-784-4338). To learn more about all of the Panasonic rugged computers Group Mobile carries, visit: http://www.groupmobile.com/brand.asp/mf_id=1/Panasonic+Toughbook.html. Panasonic Corporation of North America provides a broad line of digital and other electronics products and solutions for consumer, business and industrial use. The company is the principal North American subsidiary of Osaka, Japan-based Panasonic Corporation and the hub of Panasonic’s U.S. branding, marketing, sales, service and R&D operations. In Interbrand’s 2014 annual “Best Global Green Brands” report, Panasonic ranked number five overall and the top electronics brand in the report. As part of continuing sustainability efforts, Panasonic Corporation of North America relocated its headquarters to a new facility, built to meet LEED certification standards, adjacent to Newark Penn Station in Newark, NJ. Learn more about Panasonic at http://www.panasonic.com.